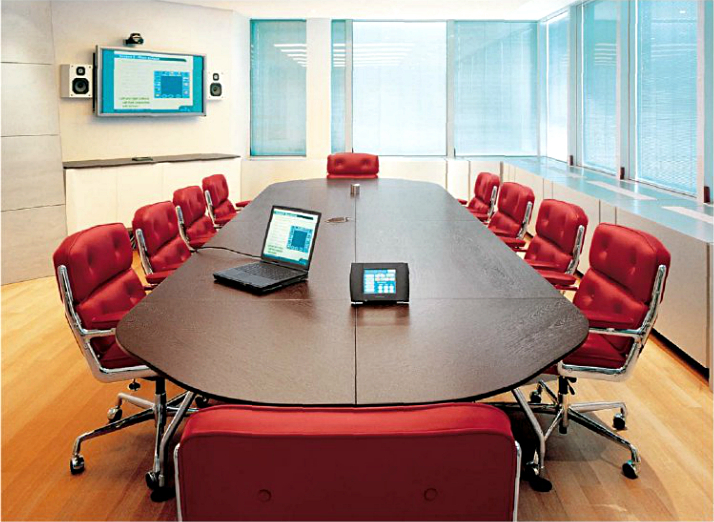 The Vitra ES 104 Lobby Chair from 1960 adorns every serious conference table; while with its self-assured leather upholstery, available in a range of colours, it serves as a more than representative executive chair. 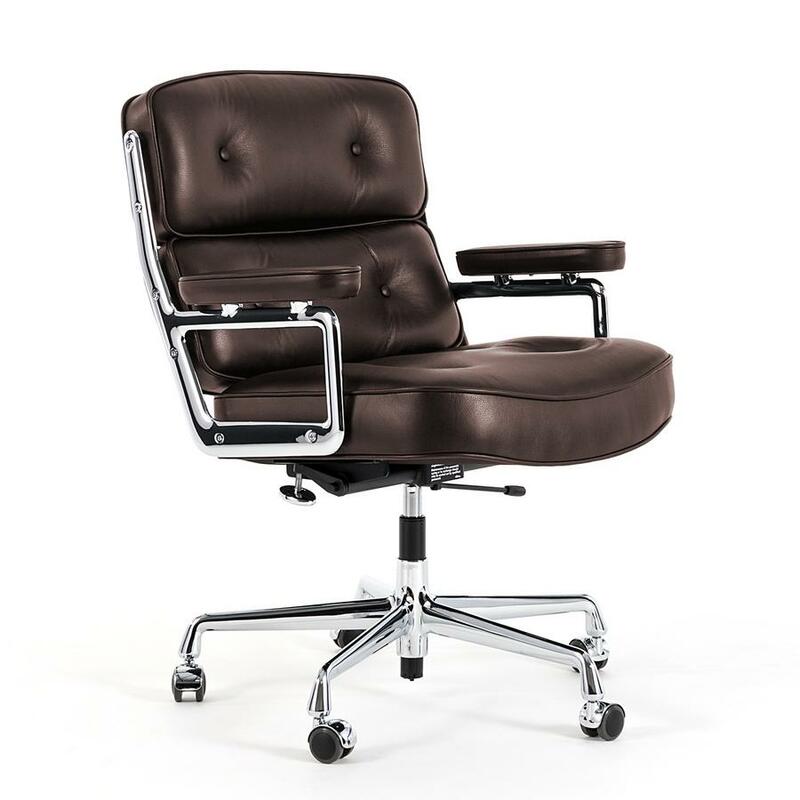 The adjustable back tilt technology, the mobile, chrome plated base and the seamless height adjusting system, provide all the flexibility you'd expect from a modern office chair. 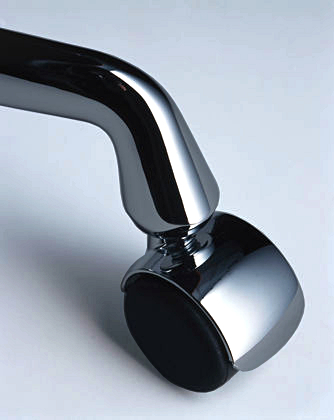 Care To clean the polished aluminium you can use a glass cleaner, for gloss chrome surfaces a little detergent and then wipe dry. 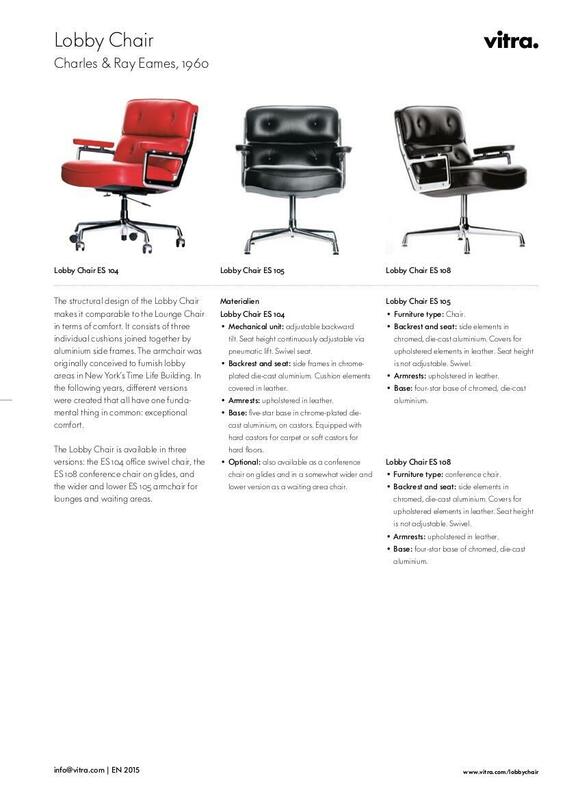 For details on cleaning and maintaining the leather covers please refer to the enclosed brochure. 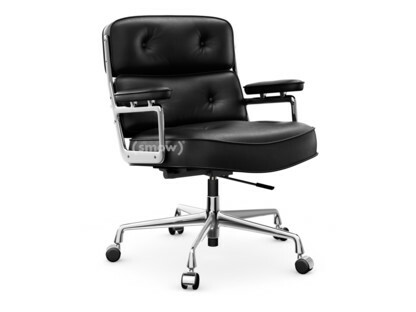 An office or conference chair the class: the mighty Eames Lobby Chair also functions effortlessly as an executive chair. Originally designed in 1960 for the Time Life Building in New York, the ES 104 has gone on to become the archetype of office and conference room chairs, and that despite being originally conceived for lobby and waiting area. A comfortable, and visually representative, chair the design principle of the Vitra Eames ES 104 is reminiscent of the Eames Lounge Chairs, however, the three cushion parts of ES 104 are connected laterally by two aluminium spars; and thus the ES 104 Executive Chair can be considered as an evolution of the Eames aluminium chair family, where precisely this construction principle of two aluminium spars is fundamentally for the sitting comfort of the very reduced chair family. 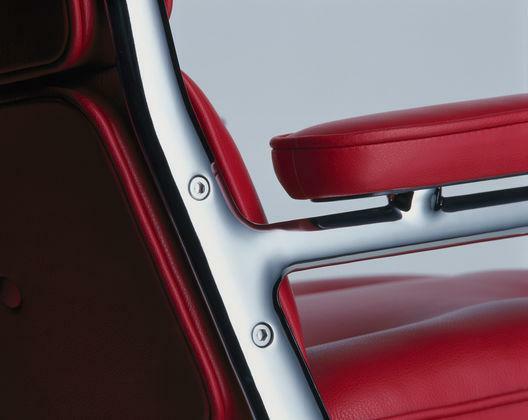 Just like the aluminium chairs so to does the Vitra ES 104 with its voluminous leather upholstery also feature adjustable back tilt technology and is effortlessly height adjustable via a gas spring. The story of the most famous designer couple of American modernism began in 1940 at the Cranbrook Academy of Arts. 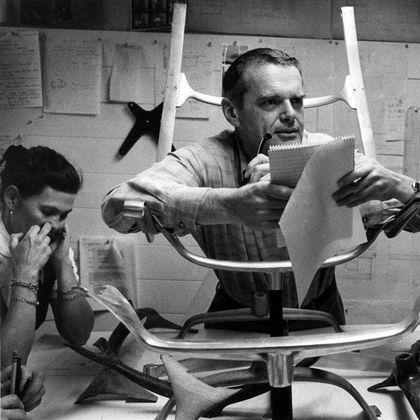 There St. Louis born Charles Eames was working with the architect Eero Saarinen on their entry for the New York Museum of Modern Art's "Low Cost Furniture" competition when Sacramento born Ray Kaiser was appointed their assistant. A year later Ray Kaiser and Charles Eames were married and thus sealed not only their personal relationship, but also began a very productive professional collaboration. 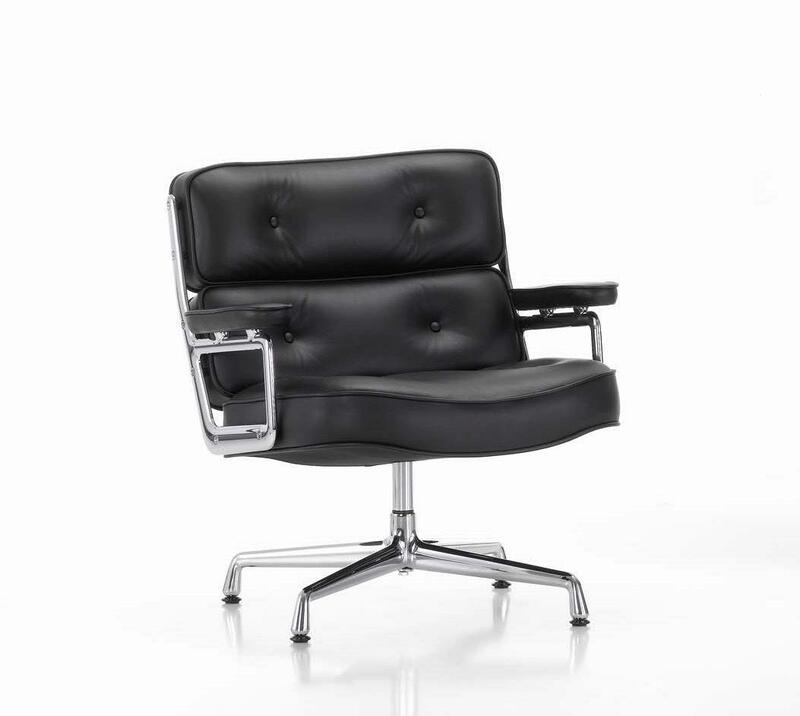 Following their wedding Charles and Ray Eames moved to Los Angeles where they established the Eames Studio and developed innumerate projects which went beyond furniture and chairs, such as the ES 104 Executive Chair, to include films, textile designs, photographs and building designs. Especially for their functional designs, for which the two designers often developed new manufacturing methods, the Eames' are considered so important in history of furniture design. 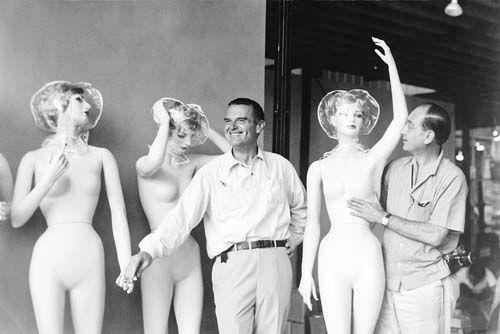 The cooperation lasted until the death of Charles Eames' in 1978, after which all the activities in the Eames Studio stopped. 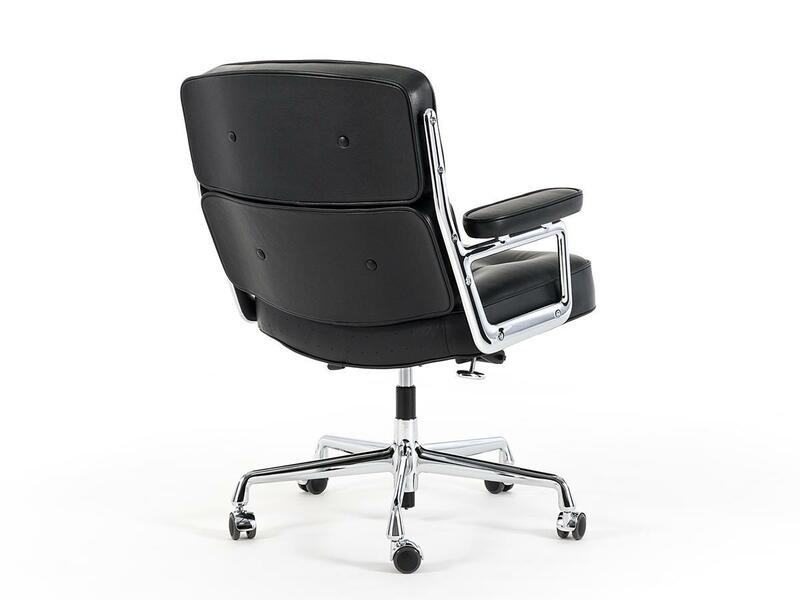 The ES 104 Executive Chair has been produced in Europe by the Swiss based furniture manufacturer Vitra ever since its inception in the 1960s. 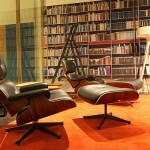 Founded in Birsfelden near Basel in 1957 Vitra possesses, in addition to the licenses for the Eames furniture, the rights to furniture designs by other American mid-century designers such as Alexander Girard or George Nelson: designers who are represented in the US by Herman Miller. Vitra and Charles & Ray Eames always enjoyed a friendly, familiar, relationship, which is why upon Ray Eames' death the estate of the designers passed to Vitra; a heritage and connection Vitra keep alive today through regular exhibitions and by an adoption of the Eames' philosophy in the company processes. In addition to designs of the Eames, Girard, Nelson et al, the Vitra portfolio also includes numerous other modern classics and the latest designs from contemporary designers such as Hella Jongerius, Konstantin Grcic or Ronan and Erwan Bouroullec. 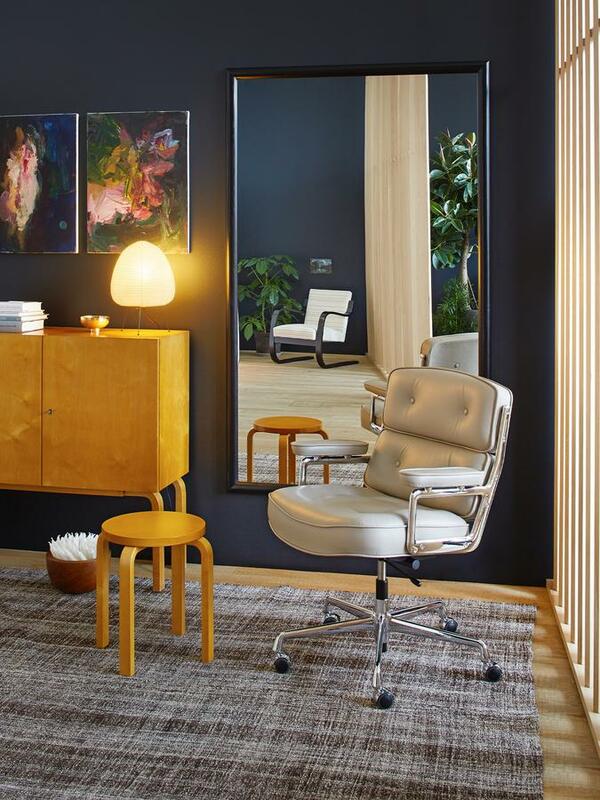 The production of the original Eames Lobby Chair ES 104 for Europe is carried out by Vitra. 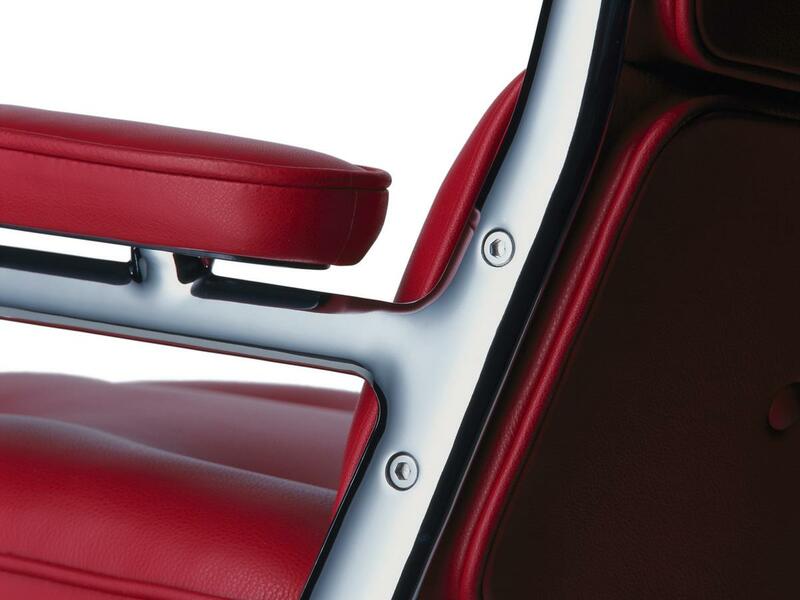 The side parts and the mobile base in chrome plated die-cast aluminium while the polyurethane foam filled, leather upholstered cushions are available in a range of colours. 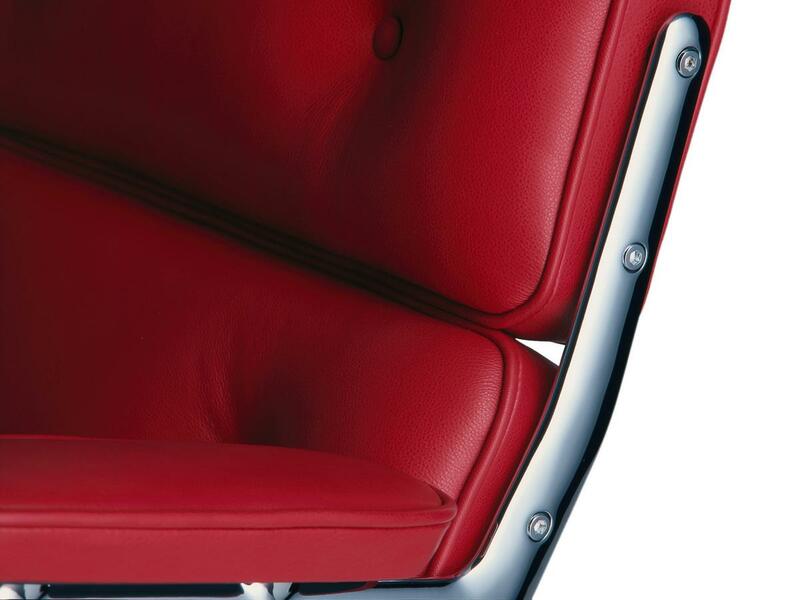 First produced by Vitra in the 1960s the Eames ES 104 belongs, as with so many of the other Eames Chairs, to those objects with who's production Vitra have over a half a century's experience: alone colours and cover materials being occasionally adjusted from time to time to reflect current trends and requirements. The consistently high quality of the Eames ES 104, it is no marketing folly that sees Vitra offer a 30-year guarantee for the quality of the Eames classics, can thus be attributed to a long tradition and the related wealth of experience. The longevity of the furniture also underscores Vitra's efforts in terms of sustainability: if furniture last for generations resources are saved. 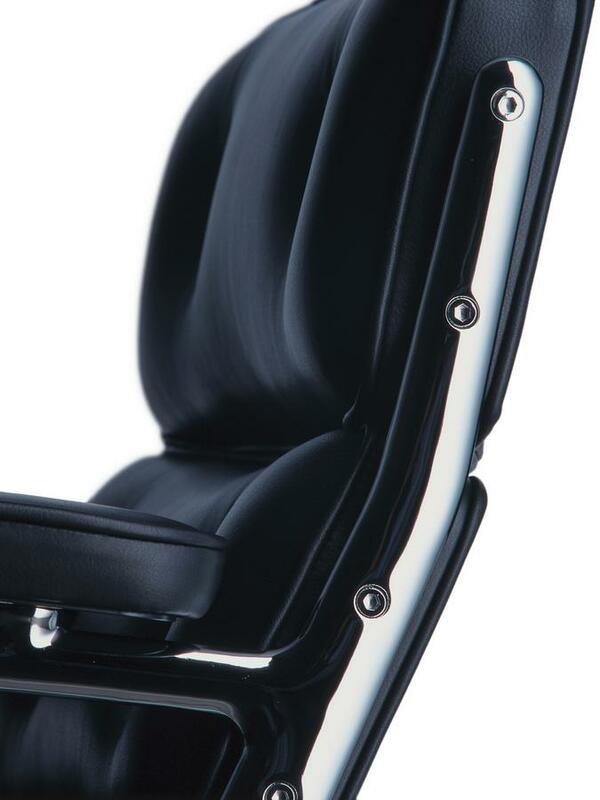 The Eames Lobby Chair ES 104 was born into an America that was dominated by the rapid progress of popular culture and the increasing importance of consumption, phenomenon largely triggered by the economic boom of the postwar years. New materials and production techniques made it possible to produce furniture in large quantities for broad sections of the population at affordable prices. Ray and Charles Eames contributed in this context, repeatedly pioneering new production processes and new uses for new materials. In addition, they often created furniture collections as a means to meet the demand for flexible solutions for modern living and working spaces. Even the Vitra ES 104 originated as a small series. 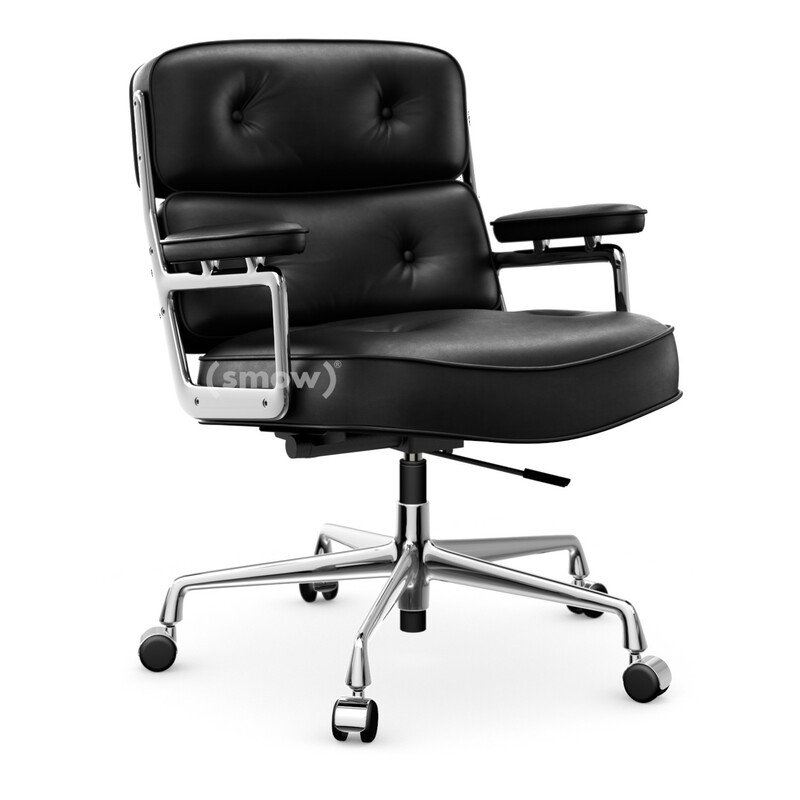 The Eames lobby chair is also available without wheels: as the ES 105 / ES 108 It is also available with a fixed four-foot base, with the ES 105 as wider and lower version, and as such offering the greatest potential for a comfortable lounge chair. The designs of Charles Eames (l.) and George Nelson (r.) are produced for Europe through the designer furniture manufacturer Vitra.